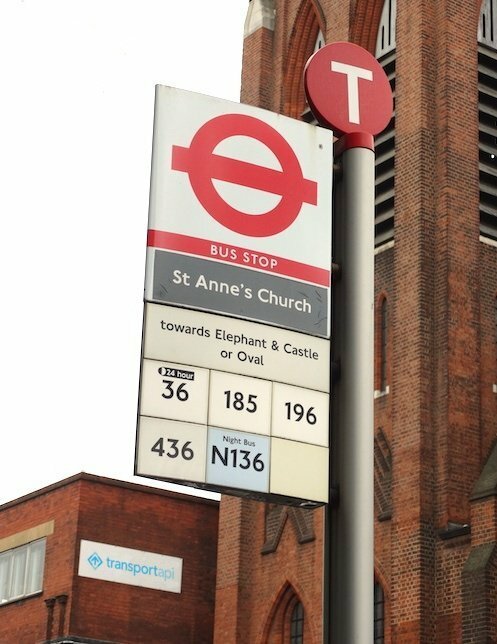 You may not be aware that every bus stop in the UK has a name. Certainly bus passengers will tend to happily travel without knowing the name their bus stop, however bus stop names are a useful bit of data, typically forming part of transport application search result displays or timetable displays. We made an improvement to the “name” field we provide for bus stops. This field will now provide a more useful (compact but not ambiguous) name because it will sometimes give a stand/bay number/letter in brackets on the end. "name":"St. Annes Church (Stop T)". “Stop T” is an “indicator” value. It will sometimes be added to the name in order to make it more unique and recognisable. We add it when an indicator value is supplied, but only if the format of that value seems appropriate. We’ll explain what I mean by that in a future blog post, but mostly we’re doing this so you don’t have to worry about it! The “name” field is our best attempt at joining together and filtering source data fields to give you a useful bit of text to display to users. Although available before, these fields are now consistently present in the lists returned by bus/stops/near, and bus/stops/bbox, in the fields towards the top of a stop live, and stop timetable request, and in the list of calling stops of a bus route request. As mentioned above, we will have another blog post with a bit more detail about the quirks we’ve found (and tidied up for you), particularly within the ‘indicator’ field of the source data. We also have some additional new fields in relation to bus departures data to report on in a blog post coming soon.